The Village has an extensive computer mapping system which stores raw data about Village owned infrastructure. The data is used to efficiently track maintenance and repairs. 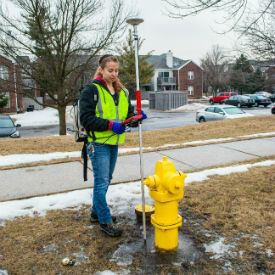 It also enables the quick location of fire hydrants in emergency situations. Ensuring this data is accurate and current is the number one priority of part-time GIS/GPS Technician Christina Curry . Check out the photo gallery on our Facebook page.